For other uses, see Moscow Airport. In 2017, the airport handled 40.1 million passengers and 308,090 aircraft movements, making the airport the 50th busiest airport in the world, the busiest in the Russian Federation and former USSR. During 2018, the Airport reported a 14,3% increase in passengers for a total of 45.8 million. There was also a 15.9% increase in aircraft traffic year over year. In December 2018, following the results of the Great Names of Russia contest, the Sheremetyevo airport was named after the great Russian poet Alexander Pushkin. Assets of Sheremetyevo International Airport JSC were consolidated as part of execution of the Decree of the President of the Russian Federation dated August 28, 2015, for the purpose of strategic development of the Moscow Aviation Cluster and large-scale modernization and reconstruction of Sheremetyevo International Airport for the 2018 FIFA World Cup. Consolidation was carried out in two stages. On May 31, 2017, the final second stage of consolidation was actually completed. As a result, reorganization took place—namely, Sheremetyevo International Airport JSC took over Sheremetyevo Airport JSC (on the basis of resolutions of the general meetings of Sheremetyevo International Airport JSC and Sheremetyevo Airport JSC dated January 26, 2017). As a result of the consolidation of assets of Sheremetyevo International Airport JSC, owners of the joint-stock company became Sheremetyevo Holding LLC (66.06% are fully owned by Sheremetyevo Holding LLC, 65.22% of which are owned by the trust of the families of Aleksandr Ponomarenko and Aleksandr Skorobogatko, and 34.78%, by Arkadiy Rotenberg), the Federal Agency for State Property Management (Rosimushchestvo) (30.46%), Aeroflot (2.43%), and VEB Capital LLC (1.05%). The General Director of Sheremetyevo International Airport JSC (since May 12, 2005) is Mikhail Vasilenko. The airport was originally built as a military airfield called Sheremetyevsky (Russian: Шереметьевский) named after a settlement with the same name. The decree about the construction of the Central Airdrome of the Air Force near the settlement of Chashnikovo (Russian: Чашниково) on the outskirts of Moscow was issued on September 1, 1953 by the Council of Ministers of the Soviet Union. The airport became operational on November 7, 1957 to celebrate the 40th anniversary of the October Revolution. 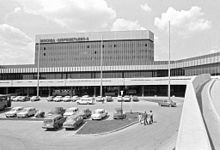 After it was decided to turn the airport into a civilian one, Sheremetyevo was opened on 11 August 1959; the first international flight took place on 1 June 1960 to Berlin Schönefeld Airport. The new airport received its name for two nearby venues: the village of Sheremetyevsky and the Savelov station on the railway of the same name. Sheremetyevo-1 (used by domestic flights) was opened on 3 September 1964. On 12 September 1967, the first scheduled passenger flight of the Tupolev Tu-134 departed from Sheremetyevo (to Stockholm), followed by the first scheduled flight of the Ilyushin Il-62 (to Montreal) on 15 September. Sheremetyevo-2, the larger of the two terminal complexes, opened on 1 January 1980 for the 1980 Summer Olympics. It was built according to the principles of design of Hannover-Langenhagen Airport and was the arrival and departure point for international flights. Flights to cities in Russia and charter flights arrived and departed from Sheremetyevo-1. In the 2000s, Sheremetyevo saw growing competition from Domodedovo International Airport, which was more modern and convenient to access. With major airlines leaving Sheremetyevo (most notably, Lufthansa, El Al, British Airways, Iberia, Japan Airlines, Brussels Airlines, Austrian Airlines, and Swiss International Air Lines), the need for reconstruction became evident. In July 2010, a walkway opened between Terminals D, E, F, and the Aeroexpress railway terminal on the public access side. In November 2010, a walkway opened between Terminals D, E, and F on the security side. Both of have simplified transfer between transit flights. Ultimately, after the northern the recent construction work, the airport now has the capacity to receive more than 40 million passengers annually. Since 2009 all terminals have been identified by letters (Latin characters). In December 2011, a new Area control center (ACC) was opened. It consolidates the gathering, monitoring, and control of the airport's different control centres across all of the organizations that affect its efficient operation. The Situational Center also forms part of the airport control center. SC is intended for joint work of top-managers, heads of state bodies, and partners of Sheremetyevo. It is activated only in the case of an emergency. In 2013, TPS Avia successfully won a competitive tender to develop Sheremetyevo International Airport’s northern area, including a new passenger terminal, a new freight terminal, a refuelling area and a tunnel linking the passenger terminal to three others terminals. In February 2016, TPS Avia combined its assets with Sheremetyevo Airport and committed to invest US$840 million to upgrade and expand the airport's infrastructure – as a result TPS Avia secured 68% stake in Sheremetyevo Airport. This infrastructure project, called the Long-Term Development Plan, aims to increase airport’s capacity to 80 million passengers a year by 2026. Sheremetyevo International Airport was the official airport of the 2018 FIFA World Cup. During the tournament, the airport observed a 16% increase in landing operations and an 11% increase in passenger traffic. In late 2018, SVO enacted a series of changes to its flight traffic. Rossiya Airlines announced the transfer of its flights from Vnukovo Airport to Sheremetyevo International Airport starting October 28, 2018. Rossiya Airlines is owned by Aeroflot. British Airways also launched direct flights from London Heathrow (LHR) to Sheremetyevo International Airport on the same day. Syrian airline Cham Wings Airlines began direct flights from Damascus to SVO in November of 2018 as well. In 2018, Sheremetyevo enter the list of the world's best airports — ACI Director General's Roll of Excellence. In March 2019, Sheremetyevo International Airport was officially awarded a 5-star terminal rating from Skytrax. This is a prestigious award for airports and airlines acknowledging the top quality of passenger services. Terminal B received the 5-star rating after a comprehensive audit. Sheremetyevo International Airport has four operating passenger terminals and one special terminal reserved for the use of private and business aviation. The airport's terminals are divided into two groups based on geographical location: the north and south terminal areas. The two terminal areas are linked by regular internal and external bus services. Opened in 2012 to the east of Terminal B, Terminal A is used for the servicing of business and private aviation. Twenty-two remote stands, which previously made up the 'Western Sector' of Terminal B, now belong to Terminal A.
Terminal B, previously Sheremetyevo-1, catered mainly to internal low-cost flights. The terminal had 64 remote aircraft stands, including 8 stands used for the maintenance of Aeroflot aircraft, and five in the 'Eastern Sector' which were used to service cargo flights. Located in the northern part of the airport, the terminal was put into operation in 1964. It was divided into two buildings: the arrival hall zone and departures area. Terminal B was remarkable for its architecturally unique and unusual spaceship-like gate area, which was connected to the main building by a passenger footbridge. The terminal's design was masterminded by a project team working under the guidance of architects and G Elkin Yu Kryukov. The terminal was demolished in August 2015 to allow a construction of a terminal building which began in October 2015. The terminal is connected by the Interterminal underground passage with terminals D, E, F and the Aeroexpress railway station. On March 12, 2007, Sheremetyevo opened its first entirely new-build terminal for the servicing of international flights. Located in the northern part of the airport and adjacent to Terminal B, it had 30 check-in counters, 36 passport control booths, a three-level automatic baggage sorting system, and six air bridges. Terminal C was closed on April 1, 2017 and demolished. The construction of the new terminal already in progress. It will be opened late 2019. Terminal D, opened in November 2009, is adjacent to Terminal F. The 172,000 m2 (1,850,000 sq ft) building is a hub for Aeroflot and its SkyTeam partners, with capacity for 12 million passengers per year. Aeroflot had been trying to implement the project of a new terminal (Sheremetyevo-3) since January 2001. However, construction only began in 2005, with commissioning of the complex finally taking place on 15 November 2009. The acquisition of its own terminal was a condition of Aeroflot's entry into the SkyTeam airline alliance, thus necessitating the construction. The main contractor for the build was a Turkish company Enka. Terminal D has 22 jetways and 11 remote stands. On November 15, 2009 at 9:15 a.m., the first flight from Terminal D (the new official name of Sheremetyevo-3) departed for the southern resort city of Sochi. Despite this, Aeroflot took a number of months (due to unexpected administrative delays) to transfer all of its international flights from Terminal F to D (a full transfer was originally planned for February 2010). Whilst previously Terminal D had remained a separate legal entity from the rest of Sheremetyevo Airport, in spring 2012, it became an integrated unit of "Sheremetyevo International Airport" JSC. As part of the deal, Aeroflot, VEB Bank, and VTB Bank, all of which had invested in the construction of Terminal D, became part shareholders in the airport as a whole. The basis for the architectural and artistic image of Terminal D is that of a giant swan with outstretched wings. There is an official multi storey parking at Terminal D connected with the main building by means of a pedestrian bridge. The parking size is about 4100 lots, however it has a relatively dense layout, so in most cases it is difficult to get out of the car without hitting the neighbouring car. Between 2014 and 2018, Terminal D used to be the only terminal at Sheremetyevo that was able to serve domestic flights. Even since new Terminal B was opened and commenced its services, Terminal D continues to operate non-Aeroflot domestic flights. Beginning on October 28, 2018, Terminal D will handle all of Rossiya Airlines’ Moscow-originating domestic flights and its international service to Indonesia. Terminal E opened in 2010 as a capacity expansion project, connecting terminals D and F. The terminal's construction has allowed for the development of terminals D and F, as well as the railway station, into a single south terminal complex. The terminals of this complex are connected by a number of pedestrian walkways with travelators, thus allowing for passengers to move freely between its constituent facilities. In December 2010, a new chapel dedicated to St. Nicholas opened on the second floor of Terminal E. The terminal is used for international flights, primarily by Aeroflot and its SkyTeam partners. Terminal E has 8 jetway equipped gates. The V-Express Transit Hotel between security/passport check-ins provides short-term accommodations for passengers changing planes without having to present a visa for entering Russia. The hotel drew international attention in June 2013 when Edward Snowden checked into the hotel while seeking asylum. Sheremetyevo-2 (now known as Terminal F) was built for the 1980 Moscow Olympics. Opened on May 6, 1980 for the Moscow Summer Olympics, Terminal F, previously Sheremetyevo-2, has 15 jetways and 21 remote aircraft stands. The terminal was designed to service 6 million passengers per year. Until the completion of Terminal C, it was the only terminal that serviced international flights. The design is a larger version of the one of Hannover-Langenhagen Airport by the same architects. A major reconstruction of the terminal and its interior space was completed by late 2009. For the convenience of passengers, the departures lounge and Duty Free zone were thoroughly modernised, whilst a number of partition walls were removed to create extra retail and lounge space. It was announced that terminal F will be re-constructed in 2021, after the construction of terminal C is completed. In 2018, the Airport reported revenue of €194.9 million, a 6% increase year over year. Profit increased 7.4% year over year. These increases are attributed in part to increased air traffic due to the 2018 FIFA World Cup. Aeroexpress train to Moscow's Belorussky station. 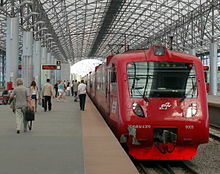 Aeroexpress, a subsidiary of Russian Railways operates a nonstop line, connecting the airport to Belorussky station in downtown Moscow. One-way journey takes 35 minutes. The trains offer adjustable seats, luggage compartments, restrooms, electric outlets. Business-class coaches available. The service started in November 2004, when express train connection was established from Savyolovsky station to Lobnya station, which is 7 km (4.3 mi) from the airport, with the remainder of the journey served by bus or taxi. On 10 June 2008, a 60,000 square meter (645,000 ft2) rail terminal opened in front of Terminal F, with direct service from Savyolovsky station. A shuttle bus service ferried passengers to terminals B and C. From 28 August 2009, the line was extended to Belorussky station with plans to serve all three of Moscow's main airports from a single point of boarding, and service to Savyolovsky station terminated. The Interterminal underground passage connects the Terminal B with Terminals D, E, F and the Aeroexpress railway station. The Interterminal underground passage consists of two separate tunnels: one of them used for a people transportation and the other one — for luggage. The former one employs a Double Shuttle Cable Liner system, an automated people mover, by the Doppelmayr where two independent cable-propelled trains run on separate tracks. In each train the first two carriages are used for landside (not checked-in) passengers and the last two ones are used for airside passengers (after a security check). At the 1st floor of the Terminal B there is an entrance to Sheremetyevo 1 — the northern station. The entrance to Sheremetyevo 2 — the southern station — is at the passage between the terminals D and E.
Moscow can be reached by the municipal Mosgortrans bus lines: 817 to station Planernaya of Moscow Metro Tagansko-Krasnopresnenskaya Line (#7), 851 to station Rechnoy Vokzal of Zamoskvoretskaya Line (#2), departures every 10 minutes, travel time 33–55 minutes by schedule depending on the terminal served. At night time bus N1 (Russian: Н1) (departures every 30 minutes between 3am and 5:40am) connects the airport to Moscow's Leningradsky Avenue, downtown area and Leninsky Avenue. Travel time 30–90 minutes, fare is 50 rubles (as of September, 2016). Other buses serve the connections to the nearest cities: Zelenograd, Khimki (routes 43,62), Tver. The main road leading to the airport—Leningradskoye Highway—has experienced large traffic jams. Since 23 December 2014, a toll road to the airport has been opened. It connects with MKAD near Dmitrovskoe Highway. Now it is possible to reach the airport in ten minutes, avoiding traffic jams. Official airport taxis are available from taxi counters in arrivals. Prices to the city are fixed based on zones. On 26 September 1960, Austrian Airlines Flight 901 crashed 11 km (6.8 mi) short of the runway at Sheremetyevo Airport. Of the 37 people on board, 31 died. On 27 November 1972, Japan Airlines Flight 446, a DC-8-62, crashed while in an initial climb on a route from Sheremetyevo International Airport to Haneda Airport. There were 14 crew members and 62 passengers on board the aircraft. A total of 9 crew and 52 passengers died, with a total of 61 of 76 occupants dead. On 28 November 1976, Aeroflot Flight 2415, a Tupolev Tu-104 crashed shortly after takeoff as result of artificial horizon failure. All 67 passengers and six crew members died in the crash. On 6 July 1982, Aeroflot Flight 411, an Ilyushin Il-62, crashed on takeoff; all 90 on board died. On 3 June 2014, Ilyushin Il-96 RA-98010 of Aeroflot was damaged beyond economical repair in a fire whilst parked. ^ ""Уральские авиалинии" будут летать в Шереметьево". travel.ru. 16 October 2017. ^ "Sheremetyevo handled more than 45 million passengers in 2018". Retrieved 6 February 2019. ^ a b "Sheremetyevo International Airport Launches Direct Flights from London Heathrow to Moscow". Russia Business Today. Retrieved 16 January 2019. ^ a b "Sheremetyevo Airport Offers Direct Flights to Damascus On Cham Wings Airline". Russia Business Today. Retrieved 16 January 2019. ^ "Sheremetyevo handled more than 45 million passengers in 2018". www.svo.aero (in Russian). Retrieved 2019-04-04. ^ a b "Sheremetyevo International Airport's Revenue Up By 6%". Russia Business Today. Retrieved 9 September 2018. ^ "Moscow's Sheremetyevo Airport Appeared as Top Secret Military Object". Retrieved 4 February 2016. ^ "Sheremetyevo International Airport Launches Walkway between Terminals D and E". Retrieved 2 June 2015. ^ a b "Sheremetyevo to Apply Literal Identification of Terminals". Retrieved 2 June 2015. ^ "Sheremetyevo's AMC: an investment in efficiency". Retrieved 2 June 2015. ^ "The new control center of Sheremetyevo airport - Russian Aviation - RUAVIATION.COM". Retrieved 2 June 2015. ^ "Heinemann partner TPS Avia set to strengthen Sheremetyevo stake". The Moodie Davitt Report. Retrieved 28 March 2018. ^ "Investors express interest in Moscow's stake in Aeroflot". ch-aviation. Retrieved 11 March 2016. ^ a b "Sheremetyevo International Airport Celebrates a Successful World Cup". MarketWatch. 14 July 2018. Retrieved 14 September 2018. ^ "Sheremetyevo Airport Tests Automated Passport Control". 6 February 2019. Retrieved 4 March 2019. ^ "Sheremetyevo Named the Best Among the Busiest Airports in Europe for the First Time". ^ "The world's most punctual airports and airlines for 2019 revealed". 4 January 2019. Retrieved 4 March 2019. ^ "Sheremetyevo Airport Wins Award for Strengthening National Security". 15 February 2019. Retrieved 4 March 2019. ^ ["Sheremetyevo Tops World's Busiest Airports Rankings in On-Time Performance" Check |url= value (help). 20 March 2019. Retrieved 4 April 2019. ^ "World Airline and Airport Rating". Skytrax. Retrieved 2019-04-04. ^ "Станция межтерминального перехода". 26 October 2016. Retrieved 31 July 2017. ^ "Aeroflot Consolidates Its Domestic Services at One Sheremetyevo Terminal". Russia Business Today. Retrieved 16 January 2019. ^ a b "Sheremetyevo Airport reports on the construction progress of World Cup facilities". Football City Media Center. Retrieved 15 January 2019. 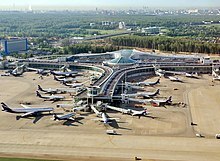 ^ "Moscow Sheremetyevo T3 opening slated for November; Russian chain Rosinter rounds out food & beverage offer 25/08/09 - TheMoodieReport.com". Retrieved 2 June 2015. ^ "Transfer of international flights to the Sheremetyevo Terminal D delayed once more :: Russia-InfoCentre". Retrieved 2 June 2015. ^ "Sheremetyevo Will Now Be Handling More Flights For Rossiya Airlines". Russia Business Today. Retrieved 15 January 2019. 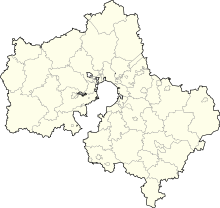 ^ "Official website – Airport Map". Archived from the original on 30 January 2010. Retrieved 31 July 2017. ^ "Snowden's plane lands in Havana, NSA leaker not seen aboard". Retrieved 2 June 2015. ^ "Реконструкция терминала F аэропорта Шереметьево начнется в 2021 году". vm.ru. 2 June 2018. ^ Liu, Jim (13 November 2018). "Aeroflot adds A330-300 Almaty service in W18". Routesonline. Retrieved 13 November 2018. ^ "Aeroflot resumes Moscow – Bukhara route from late-Oct 2018". routesonline.com. 25 September 2018. ^ "Company News - Aeroflot launches ticket sales for flights to Burgas, Bulgaria | Aeroflot". www.aeroflot.ru. Retrieved 31 August 2018. ^ "Aeroflot To Restart Egypt Flights In April". 13 March 2018. ^ "Aeroflot extends Colombo schedule into S19". RoutesOnline. Retrieved 15 January 2019. ^ "Aeroflot flight SU6266". Flightradar24. Retrieved 15 January 2019. ^ Liu, Jim (12 July 2018). "Aeroflot adds Dubai Al Maktoum service in W18". Routesonline. Retrieved 12 July 2018. ^ a b c "Aeroflot resumes 3 European routes in W18". Routesonline. 16 August 2018. Retrieved 17 August 2018. ^ a b c d e "Company News - Aeroflot launches flights to major cities in North Caucasus | Aeroflot". www.aeroflot.ru. ^ Stahl, Alexander (19 July 2018). "Izhevsk Airport ready to Welcome Aeroflot's SSJ – Aeronautics Online". aeronauticsonline.com. Retrieved 14 September 2018. ^ a b c Liu, Jim (31 August 2018). "Rossiya Airlines W18 Moscow service changes". Routesonline. Retrieved 31 August 2018. ^ a b Liu, Jim (7 December 2018). "Aeroflot adds 2 European routes in S19". Routesonline. Retrieved 7 December 2018. ^ Liu, Jim (4 July 2018). "Aeroflot adds Osh service from Oct 2018". Routesonline. Retrieved 4 July 2018. ^ ""Аэрофлот" будет летать из Москвы в Саранск". travel.ru. 29 December 2017. ^ "Aeroflot further expands domestic network in W18". Routesonline. 16 September 2018. ^ Плохотниченко, Юрий (5 December 2018). ""Аэрофлот" будет летать из Москвы на Мальорку". Travel.ru (in Russian). Retrieved 5 December 2018. ^ Liu, Jim (29 November 2018). "Air China S19 international service changes as of 28NOV18". Routesonline. Retrieved 29 November 2018. ^ "Beijing Capital adds Hangzhou – Moscow link in late-July 2018". routesonline. Retrieved 25 June 2018. ^ Liu, Jim (19 May 2017). "Beijing Capital Airlines revises Moscow launch to July 2017". Routesonline. Retrieved 19 May 2017. ^ Плохотниченко, Юрий (24 March 2019). "Belavia будет летать из Минска сразу в три московских аэропорта". Travel.ru (in Russian). Retrieved 24 March 2019. ^ British Airways resumes Moscow Sheremetyevo service from Oct 2018 Routesonline. 25 May 2018. ^ Tore, Iuliia (10 January 2019). "Brussels Airlines Moves its Moscow Route from Domodedovo to Sheremetyevo". Rus Tourism News. Retrieved 14 January 2019. ^ Liu, Jim (12 November 2018). "Cham Wings W18 Damascus – Moscow service changes". Routesonline. Retrieved 12 November 2018. ^ "China Southern plans Shenzhen – Moscow Sep 2017 launch". routesonline. Retrieved 10 July 2017. ^ Liu, Jim (15 March 2018). "China Southern S18 Urumqi – Russia service changes as of 13MAR18". Routesonline. Retrieved 15 March 2018. ^ Liu, Jim (24 January 2019). "Ellinair S19 Moscow service changes". Routesonline. Retrieved 24 January 2019. ^ Liu, Jim (6 December 2018). "Finnair expands Russia service in S19". Routesonline. Retrieved 6 December 2018. ^ Liu, Jim (8 March 2019). "Iran Air S19 Moscow aircraft changes". Routesonline. Retrieved 8 March 2019. ^ Liu, Jim (1 March 2019). "Nordwind schedules Hannover service from May 2019". Routesonline. Retrieved 1 March 2019. ^ a b c d e f g h i j k l m n o p q r s t u v w x y "Flight Search". pegasys.pegast.ru. ^ a b Liu, Jim (1 March 2019). "Nordwind schedules Spain service in S19". Routesonline. Retrieved 1 March 2019. ^ Liu, Jim (17 April 2019). "Pegas Fly S19 Moscow – Guangzhou service changes". Routesonline. Retrieved 17 April 2019. ^ "Company News - Aeroflot launches direct flights to Denpasar, Indonesia | Aeroflot". www.aeroflot.ru. Aeroflot. Retrieved 30 August 2018. ^ Плохотниченко, Юрий (13 February 2019). ""Россия" поставит Boeing 777 на линию Москва - Петербург". Travel.ru (in Russian). Retrieved 14 February 2019. ^ "Tianjin Airlines plans Hohhet – Moscow route in 3Q18". routesonline. Retrieved 25 June 2018. ^ 2017, UBM (UK) Ltd. "Ural Airlines expands Moscow Sheremetyevo network in S18". ^ "Авиакомпания Vietnam Airlines объявляет о переводе рейсов в Международный аэропорт Шереметьево со 2 июля 2019 года". www.svo.aero (in Russian). Sheremetyevo International Airport. Retrieved 11 March 2019. ^ a b Woerkom, Klaas-Jan van (13 October 2016). "Sky Gates Airlines start vluchten naar Maastricht". Retrieved 31 July 2017. ^ "Sheremetyevo handled more than 45 million passengers in 2018". www.svo.aero. ^ "Train Takes Stress Out of Sheremetyevo". Retrieved 31 July 2017. ^ "Aeroexpress services and the tariffs". Archived from the original on 2010-07-03. ^ "Doppelmayr to build Cable Liner® in Moscow". newsroom.dcc.at. Doppelmayr Cable Car GmbH & Co KG. Retrieved 2017-12-07. ^ "For passengers departing/arriving from/at the new Terminal B". Sheremetyevo International Airport. Retrieved 2018-05-31. ^ "To & from Sheremetyevo". Sheremetyevo International Airport. Retrieved 2018-05-31. ^ "Toll Road to Sheremetyevo has Opened". We heart Moscow. Retrieved 2 June 2015. ^ "Accident description". Aviation Safety Network. Retrieved 14 September 2009. ^ "28 NOV 1972 McDonnell Douglas DC-8-62 Japan Air Lines – JAL." Aviation Safety Network. Retrieved on 23 March 2009. ^ Ranter, Harro. "ASN Aircraft accident Tupolev 104B CCCP-42471 Moskva-Sheremetyevo". aviation-safety.net. Retrieved 2017-03-17. ^ Harro Ranter (6 July 1982). "ASN Aircraft accident Ilyushin 62M CCCP-86513 Moskva-Sheremetyevo Airport (SVO)". Retrieved 2 June 2015. ^ Hradecky, Simon. "Accident: Aeroflot IL96 at Moscow on Jun 3rd 2014, caught fire while parked". The Aviation Herald. Retrieved 3 June 2014. Wikivoyage has a travel guide for Sheremetyevo International Airport. Airport information for UUEE at World Aero Data. Data current as of October 2006.Source: DAFIF. Airport information for UUEE at Great Circle Mapper. Source: DAFIF (effective October 2006).